More and more people want to study their Bible using a computer or tablet. That used to mean installing complicated Bible study software, but now we’ve got some incredible online Bible study sites that let us do more than just search and read the Bible. These 6 sites include commentaries, simple original language study, and digital Bible markup. Here’s the last three of our 6 best online Bible study tools including my pick for the best online Bible study site. The Blue Letter Bible presents their Bible study tools inside a useful layout. The site’s excellent search feature sets Blue Letter Bible apart. Find the search box on the right side of the main page. Three tabs under the Search the Bible heading offer Help, Quicknav, and Adv. Options. Click on the Quicknav to jump to any Bible verse. Click on Adv. Options to narrow searches to parts of the Bible like the Old Testament or Pauline Epistles, as seen in the screen shot below. 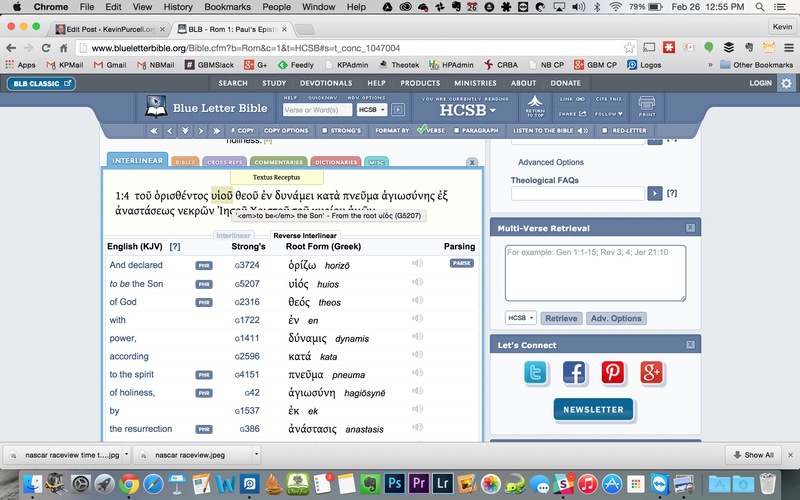 Blue Letter Bible shows some advanced searching filters. When the user navigates to a verse, the site displays them with one verse on each line and a Tools button next to the verse number on the left. Click the Tools button to find the study tools. Click on the colored tool and it opens in a pop up window with tabs. The tabs correspond with the listed tools. The tabs on the Tools pop up correspond to the Tools button list in the screenshot above. Most of the tools available are public domain. They used to sell books, but as of January 2015, the bookstore closed. The user-interface is one of the best available online, but the library leaves us wanting. Still, it’s a useful online Bible study site. Lumina content comes from Bible.org. In case you haven’t heard of it, Bible.org is a great library of simple, pastoral and scholarly Bible study tools curated by Dallas Theological Seminary. This site doesn’t include as much as some of the other sites, but it has some modern translations and the connection to Bible.org and it’s wealth of articles enhance online Bible study. 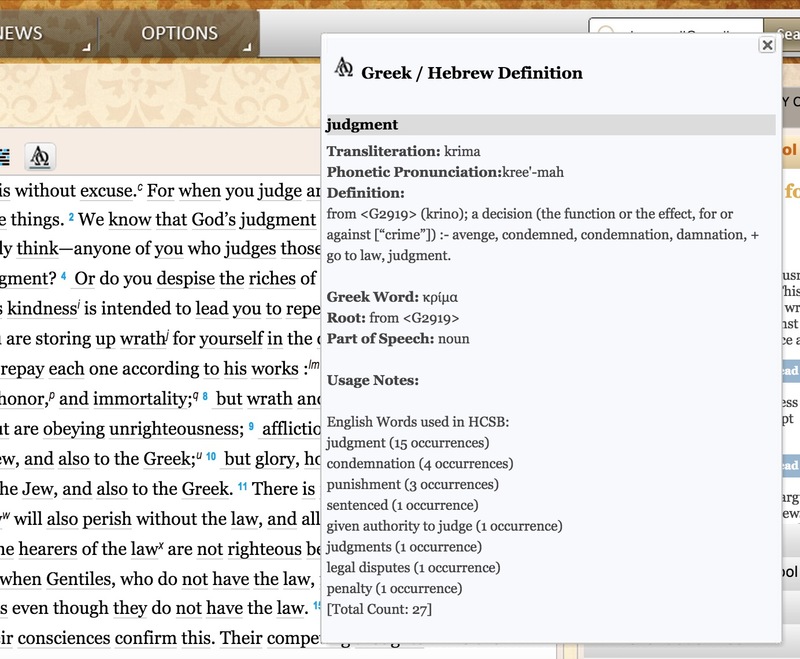 The site’s navigation makes it easy to find verses, highlight, annotate and share the Bible on social media. Do some original language work as well. Library – it includes many of the great books from WORDsearch’s library of Bible study and Christian books. Layout – MSB uses a simple user-interface that’s intuitive for novices and advanced Bible students alike. Personal Content – like a lot of these sites, it includes notes, highlights and bookmarks. Modern Translations and Resources – MSB doesn’t only offer public domain books, but recent content as well. Language Study – the site handles original language study well enough for novices and intermediate level digital Bible students to use. Help Guide – MSB offers the best tutorial guide of any of the online Bible study sites. My Study Bible enjoys the support of Lifeway’s WORDsearch library of books. MyStudyBible.com comes from Lifeway and WORDsearch. It’s this huge library of nearly 2,000 books that makes it my pick. The site includes more books with a greater variety than all but one of our 6 best online Bible study sites (the other is Biblia from Logos). Not all of WORDsearch’s books work with the site, but a large percentage do. Notice the attractive layout with the Bible taking center stage and reference material along the right. The left shows the current open book, the user’s account user name with or a link to sign into the site, a link to notes and new books under the New Arrivals link. Notice the words get underline. Click one to show the language study information. When the user turns on Strong’s links, the words with corresponding Strong’s Numbers get underlined. Click to show a pop up of the word’s language study information. This only works in translations that come with Strong’s tagging. 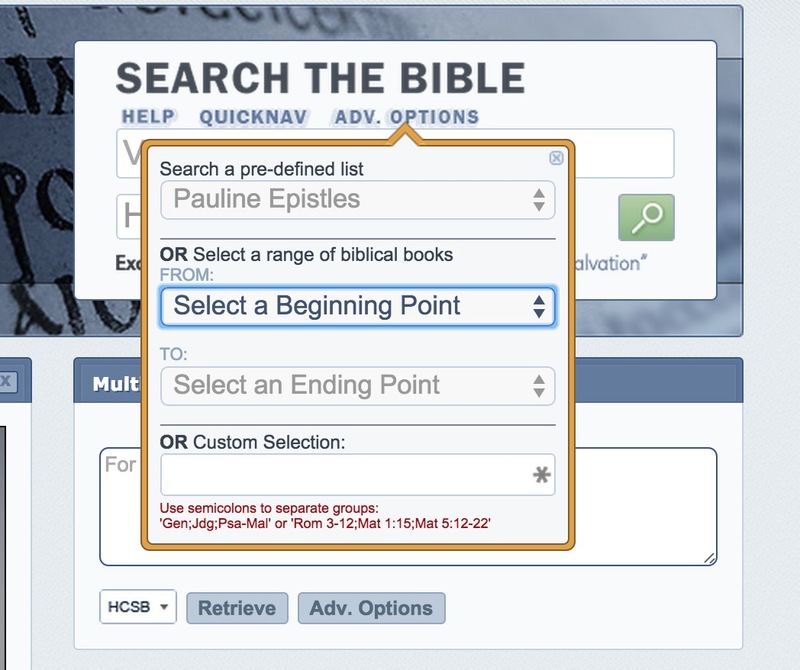 Learn to use MyStudyBible by clicking the small down arrow at the top center to show this helpful guide overlay. At the top of center of the screen notice a small arrow pointing down. Click and the above guide shows how to use the site’s features. No other site presents this kind of help as simply and elegantly. If you know of a great online Bible study site that I’ve not included, please comment below. All comments get moderated, but only for offensive content and spam. i am AMAZED people don’t get how important Strong’s numbers are! it is by far the most straight forward easy methods of doing true word studies. I also am so fustrated by any Bible. Apps that don’t have a simple way to find all varients of a word using an astrix after whatever letters are common to all variations. Like fai*. Will return EVERY word starting with those three letters etc…immensly valuable finding verses! Also a MUST is being able to search for strong’s numbers rather than spelled words! And combinations of strongs number WITH spelled words. The Online Bible is the ONLY program that I personally know of that has these features…am I stupid in not seeing how to do it on other programs or is it really the only program with all these precious features? I SUSPECT if there are any others they are going to cost money? I am really only interested in finding something equal to the online bible I can access. On chromebook? Is there anything?? Which programs CAN the chromebook access? do you know? Does Online Bible even have a truly online solution. I know it predates the modern Internet but I thought it only came in an installed locally form. If I’m wrong please provide a link.